We really owe the American bison an apology. But where do you buy a card that says, "Sorry we wiped out nearly your entire species, then muddied your DNA by forcing you to mate with cows"? Would flowers be better? In the 19th century Americans slaughtered bison (also referred to as buffaloes) with impunity. We killed them to sell their skins, to get them out of the way of our new trains, and to make life harder for Native Americans. It wasn't a shining moment. By the end of the 1800s the bison were nearly gone, reduced to perhaps as few as 100 animals in several small herds. Even as Americans worked to restore bison in the early 20th century, we botched their genetics by breeding the animals with domestic cattle. Breeders wanted to make their cattle beefier and hardier. But the crossing wasn't easy, since the two species are separated by 1 to 2 million years of evolution. In addition to the question of genetic incompatibility, there was one of attraction: female bison refused to mate with male cattle. James Derr, a professor in the veterinary college at Texas A&M University, explains that the hopeful breeders could only get male bison to mate with female cattle. And their offspring were all female; the species' mismatched genes apparently couldn't create a surviving male. These female hybrids were mated with more male bison. The result was a population of cattle-bison hybrids whose mitochondrial DNA—a little loop of genetic material passed solely through mothers—was 100% cattle. In today's restored population, many bison still carry cattle mitochondrial DNA left over from the two species' historical tryst. To find out whether that genetic souvenir has any effect on today's animals, James Derr led a study of bison living in the wild and on a feedlot. The herd of wild bison Derr studied live on Santa Catalina Island, off the southern coast of California, where they were introduced in 1924 for the filming of a silent movie. (Oops, better add that to the card.) Looking at their DNA, Derr found that almost half the bison carried mitochondrial DNA from cattle. The second bison population in the study was a group living on a feedlot in Montana, preparing to become products such as bison burgers. (On second thought, maybe a card won't cut it.) In these animals, cattle mitochondrial DNA was much rarer, at 6 percent. By comparing the animals from the two populations, Derr could look for the effects of cattle mitochondrial DNA in both a wild population with limited resources and a well-fed ranch population. The feedlot bison were clearly beefier; at age 2 the feedlot males had reached a size that the island bison wouldn't attain until they were 17 years old. Despite the two very different body types in the study, cattle genes had a clear effect across populations. Derr reports in Conservation Biology that bison with cattle mitochondrial DNA were slightly but significantly smaller than bison with mitochondrial DNA from their own species. Bison that are smaller because of their domestic cattle DNA might be at a disadvantage. Derr says it's not clear yet whether this is the case—smaller size might have no effect on the fitness of bison, or it might even help them in places with limited resources like Santa Catalina Island. He plans to answer that question in a separate study. If it turns out that having mitochondrial DNA from cattle hurts bison, the next question will be whether conservationists should try to weed these genes out of the population. Overall, Derr says, about 6 percent of bison carry cattle mitochondrial DNA, though in individual herds that number can range from 0 to 100 percent. It may be that by restoring the bison's genome to what it once was, we can start to make amends. 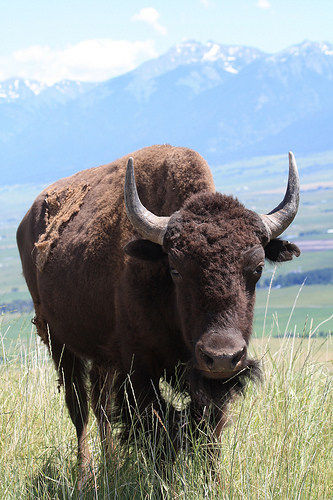 Bison ranchers today are commited to protecting the integrity of bison genetics. The cattle genetics found in the small number of animals in private herds are largely the result of events that happend 120 years ago. The National Bison Association has information on the facts behind this issue. www.bisoncentral.com.